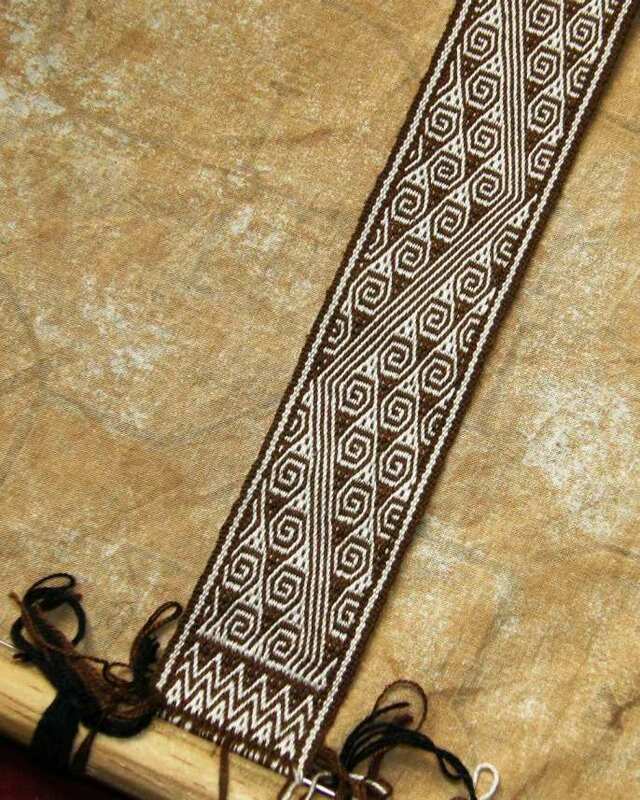 People often watch indigenous weavers work at their looms picking up threads and creating incredibly intricate patterns and marvel at the fact that the designs are in their heads and not on paper in the form of a chart. 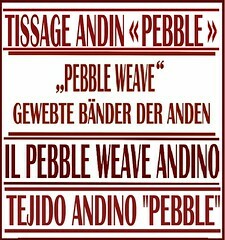 I was tickled that at a recent backstrap weaving demonstration day, people made remarks about the fact that I wasn’t using a chart as I was weaving. 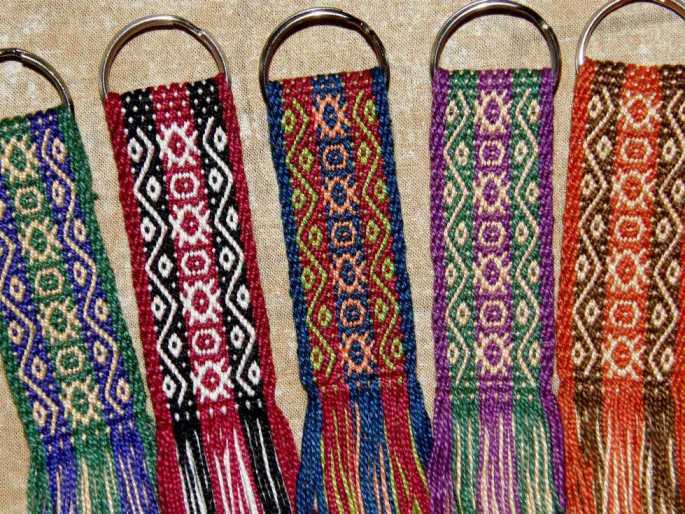 My pattern was a pretty narrow one within a very large field of plain weave and I pointed out that I had once woven a marathon of forty keyfobs with this particular pattern and that I could probably weave it in my sleep! Repetition had made what looked like a complex design to my audience, an exceedingly simple one to me. But, I want to emphasise that there is nothing wrong with using a pattern chart! 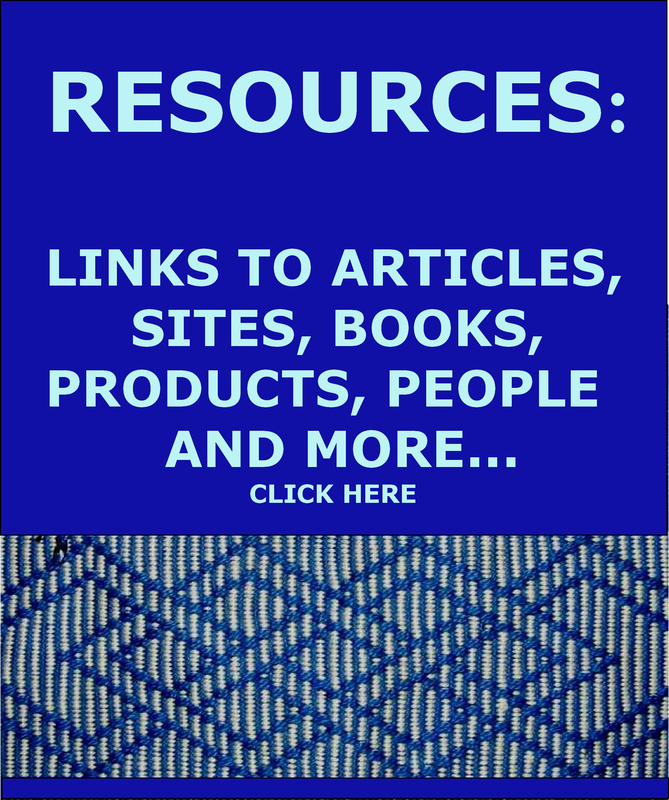 In my blog post of January 11, 2013 I talked about the large Wayuu pattern that I had adapted at left and which I was weaving from a chart. It was slow going and tedious until I was able to break down the pattern sections in my head as I wove, recognize repeats and reversals, and see the entire design as a series of small easily memorised elements placed together in an ordered fashion to make the pattern. Chris Buckley writes about indigenous weavers’ use of a limited repertoire of shapes which they use in building-block style to create large patterns in his paper on ikat weaving of SE Asia…. 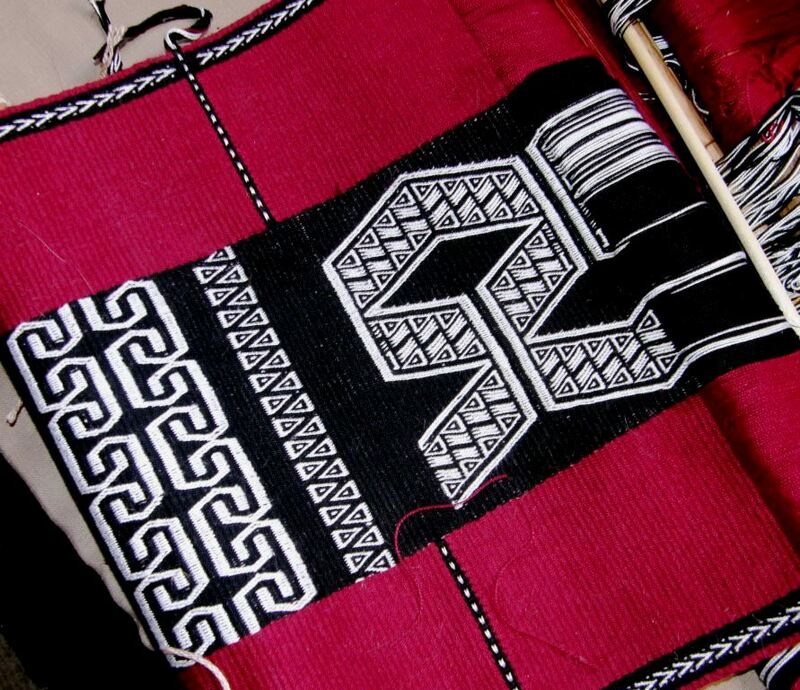 But, let’s face it, we like to weave ethnic designs and draw on inspiration from indigenous patterns from all over the world. We don’t need to limit ourselves to just a certain collection of shapes. 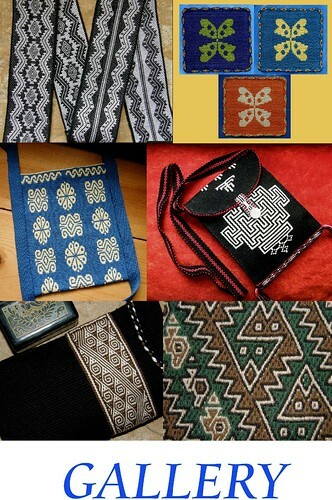 We may decide to weave something based on an Andean pattern this month and something from Bhutan or the Middle East, or Scandinavia the next…designs which comprise a myriad of forms and which require a variety of techniques to execute. We are not trying to become indigenous weavers. We haven’t been surrounded by weaving and weavers all our lives, started our training at a young age and had our vision focused on a limited repertoire of shapes, forms and arrangements used by a particular culture. This means that we need to use pattern charts and that’s okay. If it is not a long piece that you are weaving, you may never get to that point where you feel you have absorbed the pattern and can put the chart away. You may finish that piece and never weave that pattern again. I tried and tried to let go of the chart when weaving the Tarahumara pattern above. The basic hook formation was simple enough but it was very tricky as it moved across the cloth and swirled this way and that. I clung to that chart to the very last weft pass! But it is fun to challenge yourself to look more at the cloth as you weave and less at the chart while studying the way the design develops with every weft pass, watching when and how the warps float, and recognizing repeated elements within the design. The pick-up is a piece of cake now…really! There’s nothing like repetition to firmly embed a design in your head and fingers. It began with lots of tedious chart reading which was made a lot easier with the use of removable highlighter tape. Then I played a favorite game…read the cloth and guess what comes next. 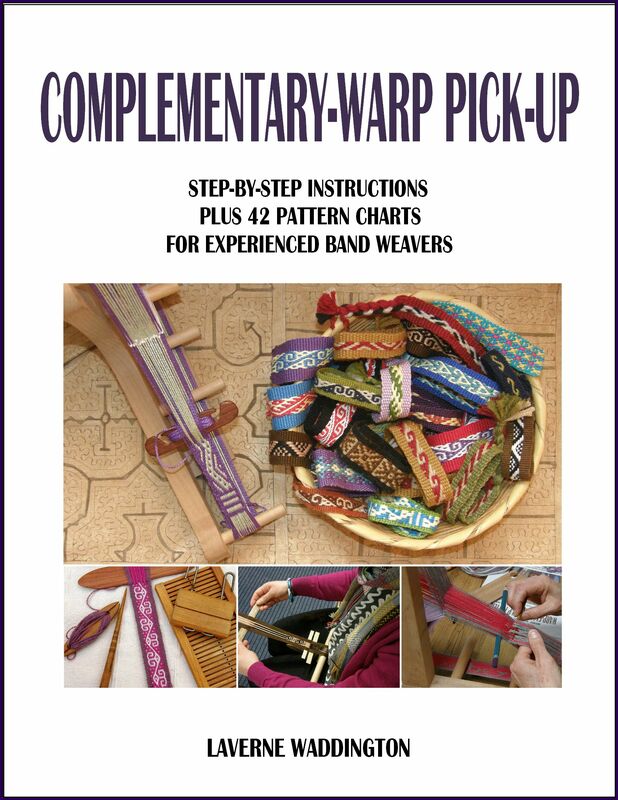 Then, before passing the weft, sneak a peek at the chart to see if you are correct. Next comes reading the cloth, deciding what comes next and going for it. Beat, pass the weft and then look at the cloth, not at the chart, to see if you were correct. Eventually you reach that chart-free happy place. I should point out that the process of reaching that chart-free happy place, as outlined above, will most likely involve a fair bit of unweaving!…a very important weaving skill. You don’t want to be in a hurry as this process will slow you down. You have to really want to do it and be patient with yourself. But I can’t tell you what a great feeling it is when you are able to weave on chart-free. And it is important to recognize that some structures allow one to “read the cloth” far more quickly and easily than others. A structure like warp-faced double weave, which does not involve warp floats, is far easier to read than one that is based on floats. I find supplementary-warp float structures easier to read than complementary-warp ones. 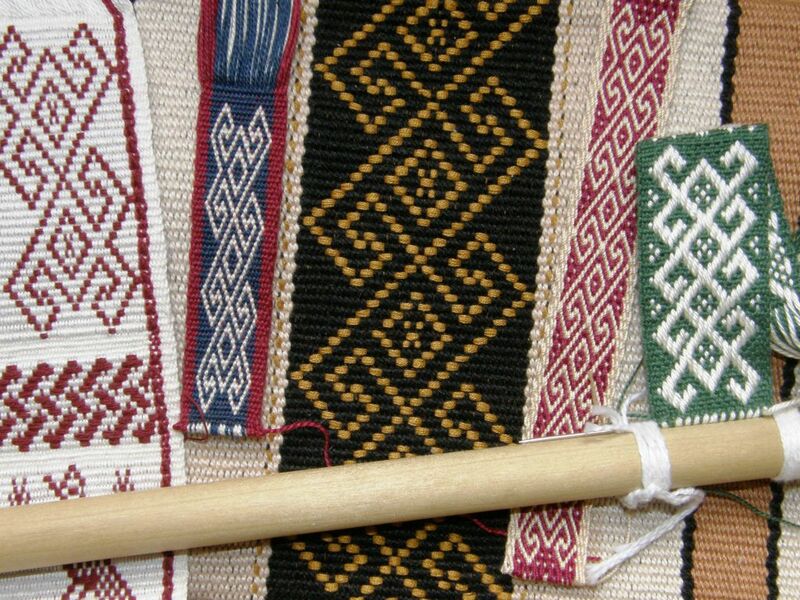 You can see the same basic Central Asian hook pattern woven at left using a variety of structures. 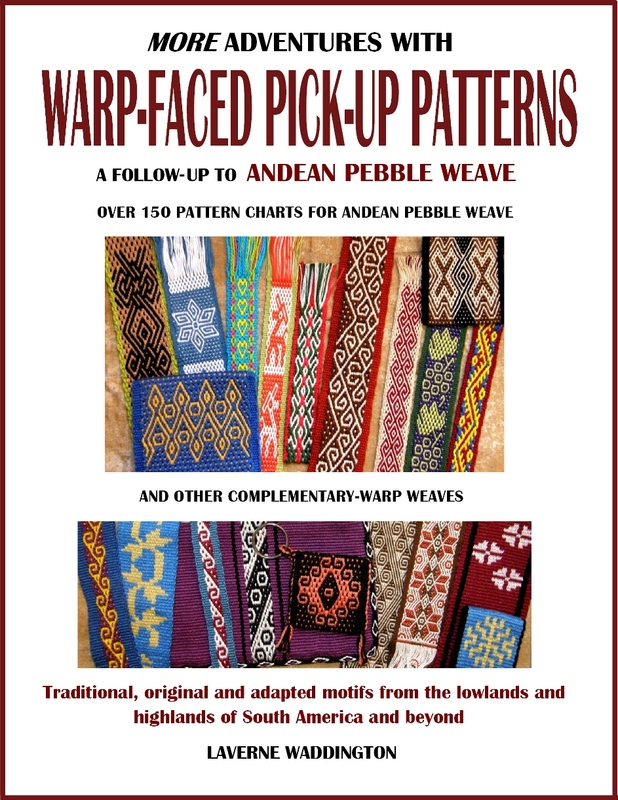 The supplementary-weft (gold on black in the center and red on white on the left)) and double weave (white on blue) versions were the easiest to weave by simply reading the cloth and folllowing the lines of the pattern rather than reading a chart. I think most people are happy to see a design they like and want to weave, learn how to read the chart, follow the chart row and row, complete their project and never weave that particular pattern again much the same as knitters do, right? I do that many many times in my eagerness to experiment with the never ending stream of patterns and structures that come my way in my research of traditional backstrap weaving around the world.